Discover dynamic education programs and curriculum resources about the history of our city, state, and nation. 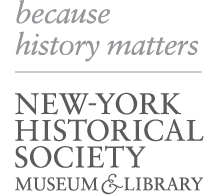 The New-York Historical Society Education Division provides dynamic programming and curriculum resources for students and teachers in New York and beyond. Historical study sparks curiosity and creativity, promotes cultural understanding, and fosters an empowered citizenry to strengthen our democracy. Our staff of passionate professionals draws on our world-renowned collections to engage learners of all ages in the study of our collective past. Participants in the 2017 NEH Summer Institute for School Teachers—American Women at War—created lesson plans for the wars under study as their final project. All lesson plans were designed to address the needs of the target grade level and subject matter taught by participants. Teachers drew from academic scholarship, primary sources, and pedagogical techniques developed over the course of the Institute. Explore their lessons below!